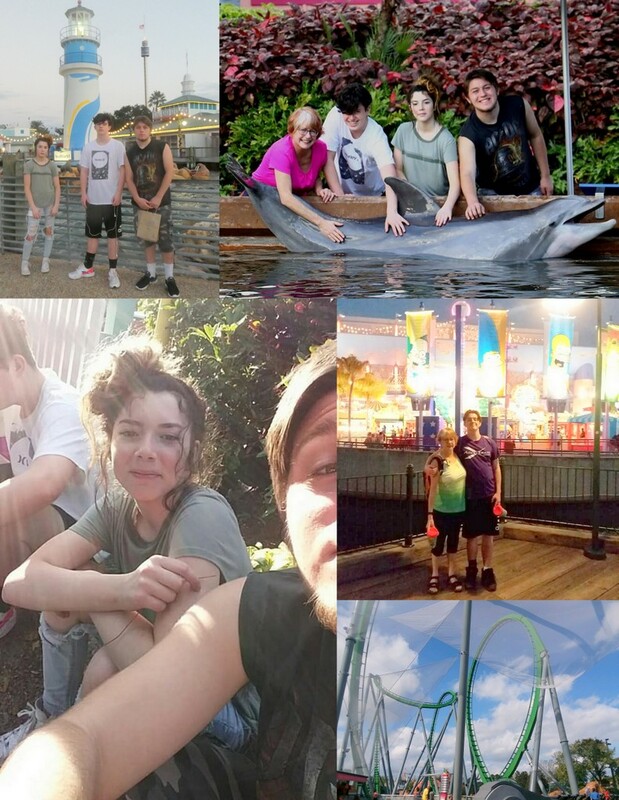 Kathryn took Eric, Stone and Dakota to Orlando FL for their Christmas gift. They had a fun trip, though it went fast with a lot of rushing around. Both Stone and Dakota had been sick the week before. Stone’s congestion was nasty sounding. They got to Orlando on Friday in time to catch the last shuttle from the hotel to Universal (11 AM). They did most of Universal on Friday, until they got too tired with half were hungry, half not; half wanted to take the shuttle to the hotel and half wanted to walk the 1.2 miles in the dark etc. Eric’s ankle hurt the first night but it didn’t seem to bother him after that though. 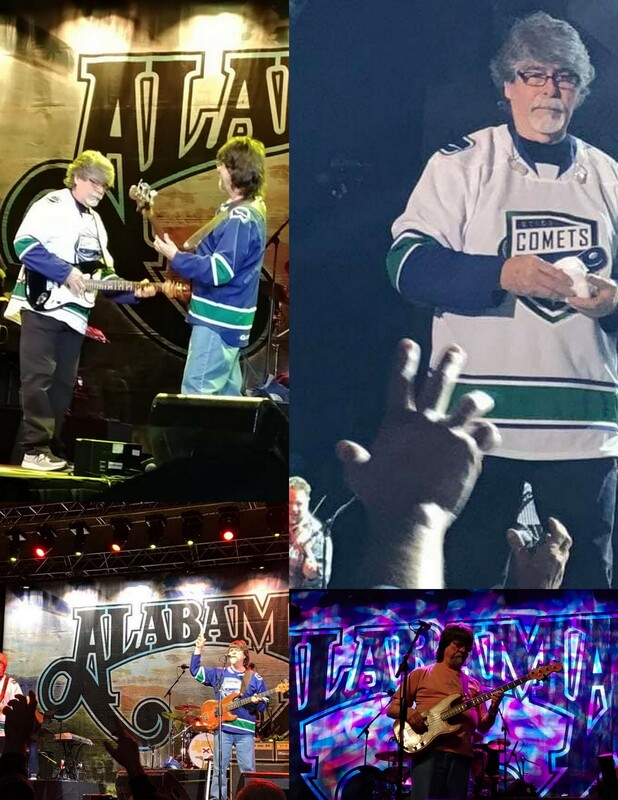 However, it was a lot of fun. They got to do the Harry Potter ride twice. We did “Men in Black” several times. They went on some BIG roller coasters; the Kraken and the Hulk. We didn’t have to wait long for rides so got to do a lot. 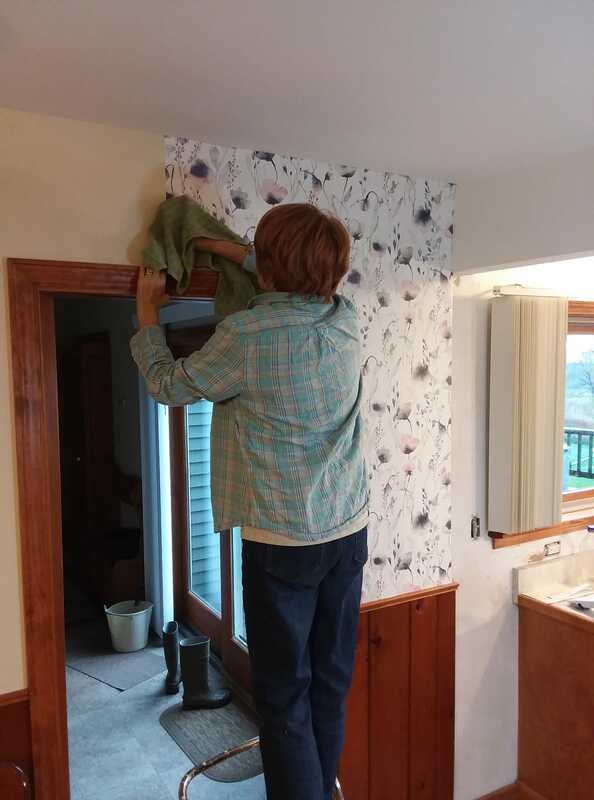 For the past 18 months I have been lobbying for alternative wallpaper in our family great room. The existing dark red wallpaper, coupled with the knotty pine paneling, made the room too dark. Kathryn selected new wallpaper and while Eric was at the HP football game at the Carrier Dome we (mainly Kathryn) put up the new wallpaper. 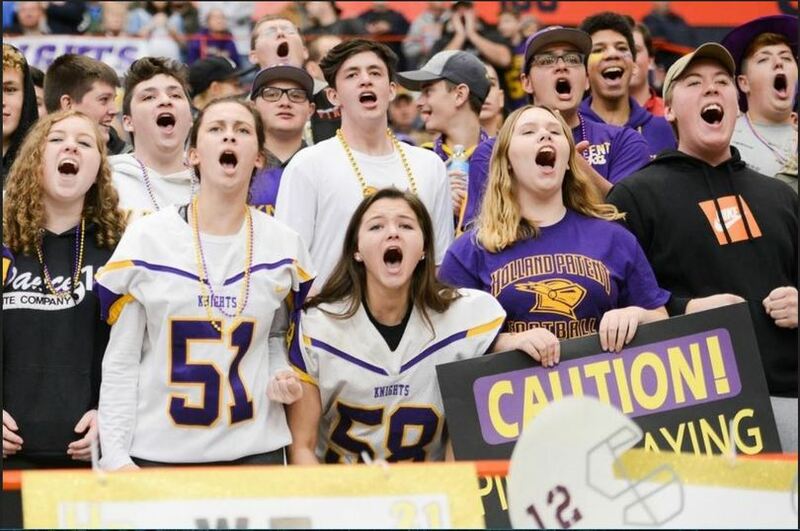 Holland Patent scored 14 unanswered in a WILD fourth quarter to win Section III Class C Football Championship. Holland Patent defeated General Brown/Immaculate Heart today 21-14 for the Section 3 Class C title. Susquehanna Valley defeated Waverly 62-7 for the Section 4 Class C Championship. SV will play Holland Patent next Saturday at High Noon at Cicero-North Syracuse High School. Eric attended the HP vs Lowville football game held at Ilion. Holland Patent scored five first-half touchdowns and went on to a 49-28 Section III, Class C football victory over Lowville Academy Friday night at Central Valley Academy’s Diss Field Memorial Field. 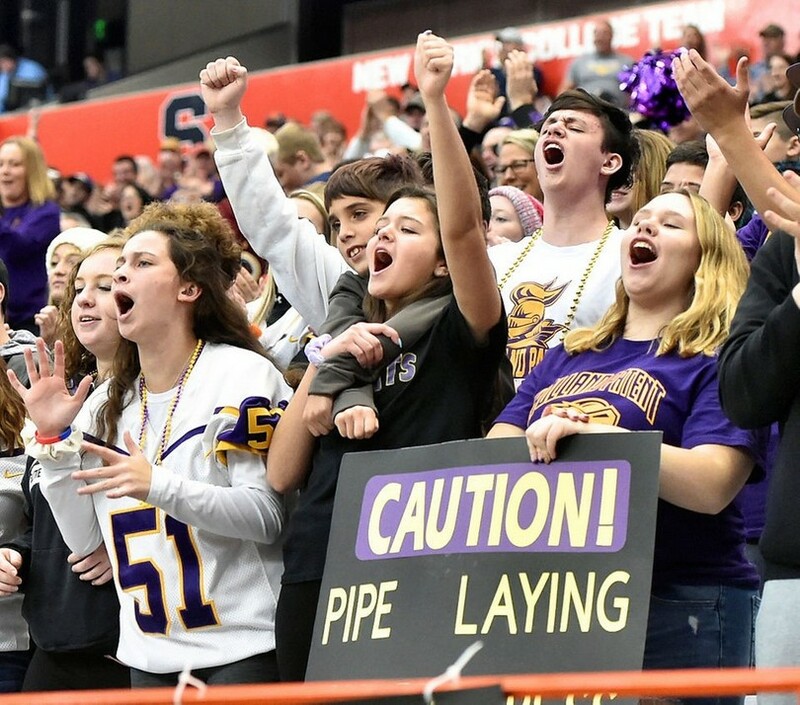 Holland Patent, 9-0 and ranked sixth in the state, will head to the Carrier Dome to play General Brown for the title at 1 p.m. Saturday, November 3. Girls Varsity Soccer advanced to Tuesday’s region semifinal on sophomore Taylor Koenig’s deciding kick, helping the Knights (18-1-1) edge Clinton (17-2-2) in penalty kicks 5-4. Clinton had a 62-minute goal by Sarah Owens’ and Holland Patent’s matched with a game-tying goal by Meaghan Greenway with 10.7 seconds remaining in regulation. The win sends the top-seeded Holland Patent Golden Knights (18-1-1) to the New York State Public High School Athletic Association regional semifinal, which will be against the Section X champion Tuesday at G. Ray Bodley High School. History was made for the HP girls Varsity Soccer ⚽️ program as they won their first ever Section 3 title after a long three hour battle against Clinton that was decided by penalty kicks. With the win in penalty kicks, the girls are participating in the NY State competition and have a regional semi-final game tomorrow (Tuesday) at 6pm at G. Ray Bodley High School in Fulton, NY against Section 10 Champion Potsdam. 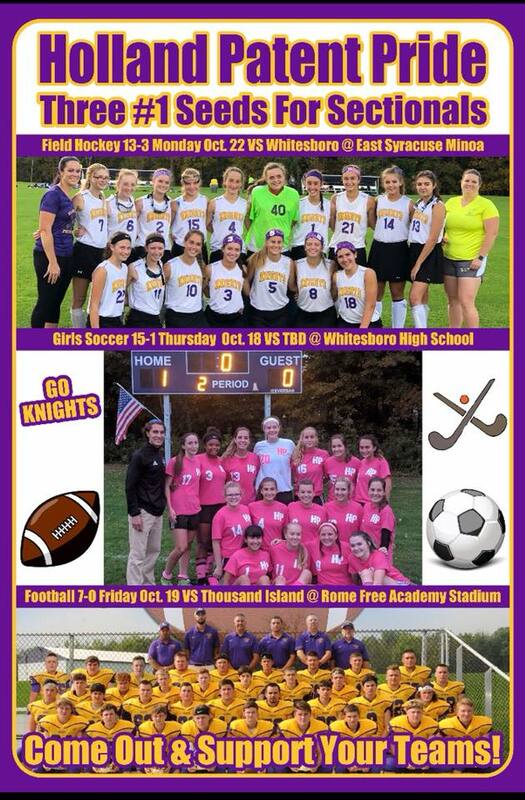 Congratulations also goes to the Lady Knights Field hockey  team. They also made history by bringing home back-to-back Sectional titles as Section 3 Class B Champions! They beat ESM by a score of 3-1 yesterday. HoPaFiHo will also play in the state tournament’s regional contest and face Afton at noon on Saturday 11/3 at Cicero-North Syracuse High School. While playing volleyball in the Empire Senior Games in June Kathryn was asked to join a 60+ volleyball team going to the Huntsman Senior Games in St George Utah. We were delighted to go as Kochans volunteered to host Eric while we were gone. We flew out of Syracuse after Kathryn’s classes on Thursday, landing in Las Vegas at midnight and driving two hour to St George where we were sharing a house with Kathryn’s volleyball acquaintance, Barb. We had a brief respite with a few hours sleep and then left for the 1st 9am game. 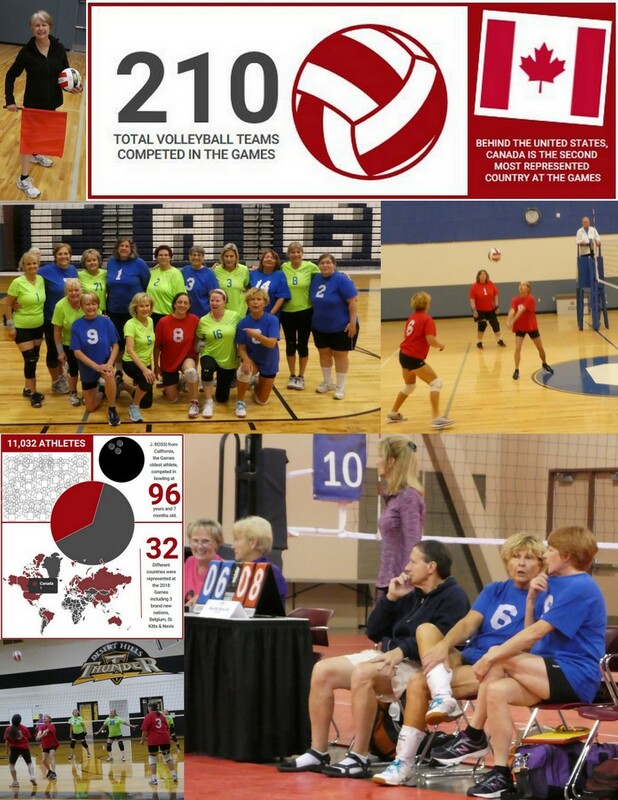 There were 27 60+ woman’s volleyball teams divided into 3 pools, with 9 teams in each pool. Each team played 3 matches / day with a match comprising of two games. Before each match the teams would meet at center court and exchange gifts, and after each game the two teams would combine for a group photo. There were teams from Colorado, California, Canada, Brazil, Bolivia, etc. While most of these teams had established rosters and had practiced together, the GREAT EXPECTATIONS team had never played together and found themselves making introductions prior to the match. There were matches Friday & Saturday; Sunday was off and more games on Monday & Tuesday. They won a couple of games, had a couple of competitive matches and really only got overpowered by the Team Brazil. Overall, it was a great venue to play, Kathryn enjoyed playing vs age appropriate competition. Plans are being made for a 2019 Huntsman team. 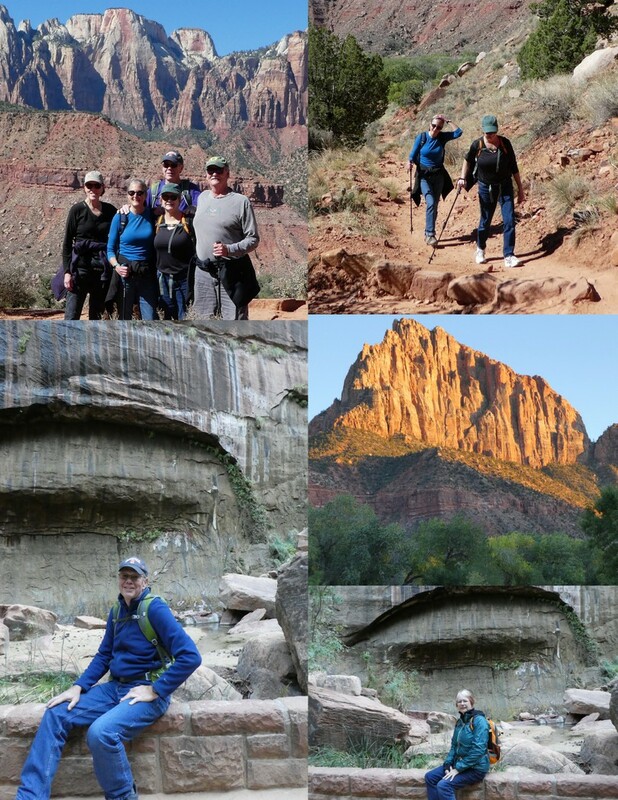 There were no Huntsman activities on Sunday so we drove to Zion National Park to meet up with Kent and Kathy. We did a short (3.5 miles) hike up the Watchman and rode the bus to the Narrows. The weather was perfect. Eric had a 3 week follow up appointment for his ankle surgery. 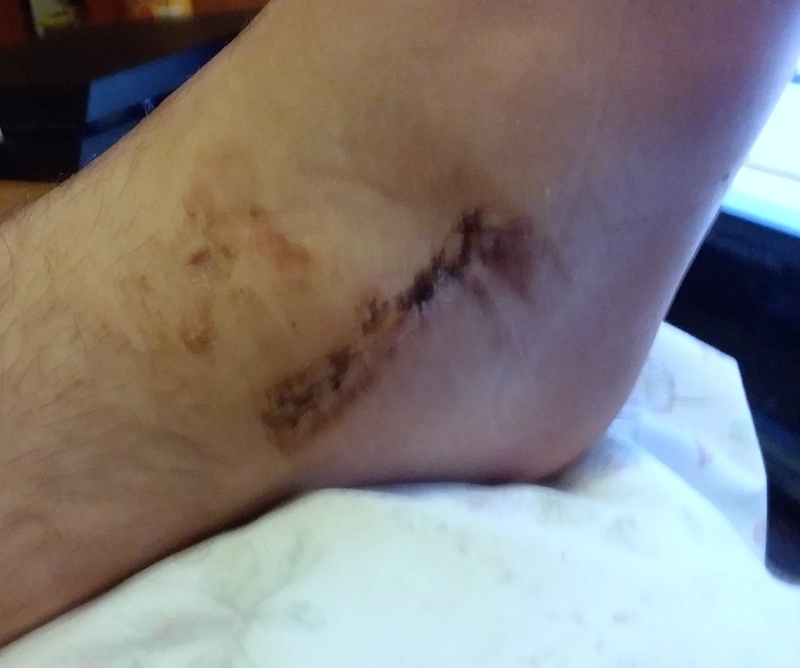 All the bandages came off and the incision looked fine. He can begin weight-bearing exercise at PT and home. He will still be riding the scooter between classes in school for one more month. He can remove the boot while resting as he sees fit. The goal is to have him riding an exercise bike and be transitioned to an ankle brace by the end of the month. Sunday – 6am and I am in Skip’s driveway and he is in mine as we got mixed up on our departure. A quick phone call and we got straightened out and headed north on Route 12. We had 9 hours of driving time and 11 hours total travel time including lunch and meeting at Walmart, to get to Killarney Outfitters. Conrad and Jack rented a canoe and accessories. We finally found a place open to give us dinner and returned to squeeze 4 tents into our small site; so snoring was an issue. Monday- We sorted out our gear and got packed. We were on the water at 0945. There was over a mile (1.6 km) over 4 portages. After the 1st couple I got more organized and carried two packs and the lawn chair then doubled back for the canoe. We stayed at Muriel Lake for night 1. Steve thawed his beef stew only to discover it was Skip’s chili. 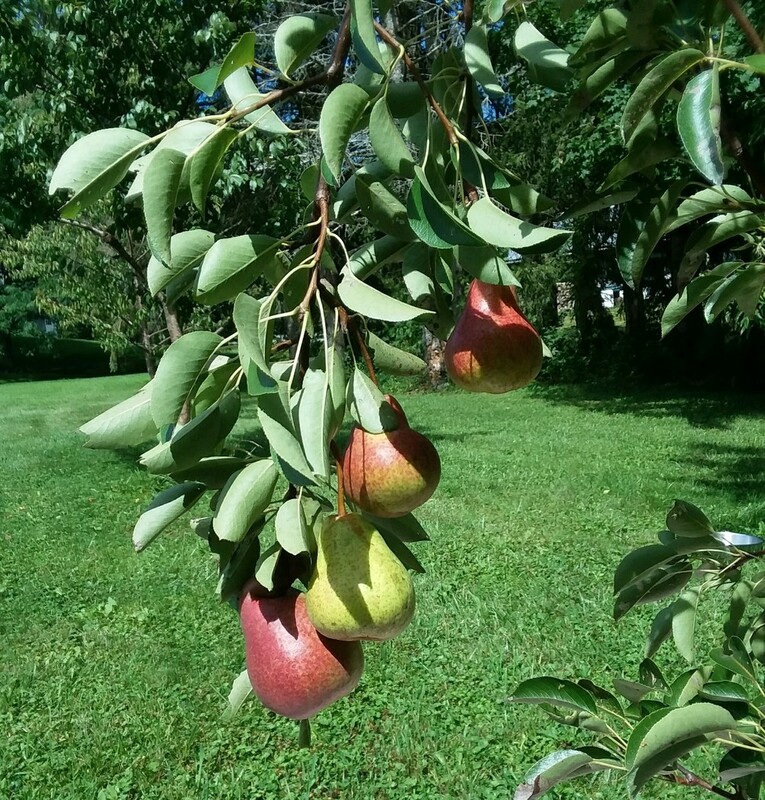 We were lucky to avoid the rain or high winds which predicted in the forecast. However, it remained cloudy and the temperature dropped at 0600. Skip’s chili dinner was good. During the night Skip awoke from a dream convinced a bear had taken down out hung food. He yelled ‘There’s a bear getting our food’ and got everyone to go look. Of course, there was no bear and the food was fine. Tuesday – After a leisurely breakfast we were on the water by 0930. We had difficulty finding the 1st portage and portaged into a weed choked Artist Lake. 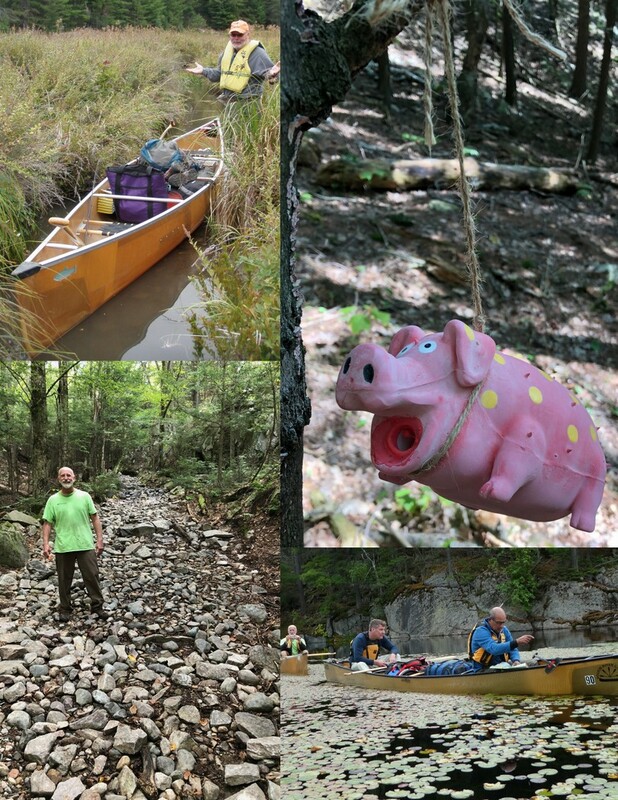 The day was dominated by “The Pig” a 3 hour portage with 1,000 meter elevation gain. It was a rough portage with lots of cobblestones; fortunately the stream bed was dry. Conrad and Jack took a side trail to Topaz Lake and enjoyed lunch and a swim. We got off The Pig at 3pm and spent two hours paddling for a campsite, ending up on Site #50 Doris Island. We all did a swim before dinner washing off the day’s sweat. We had Steve’s beef stew for dinner. We turned in at 8pm. I read for 1 hour and slept the night. I heard a lot of Barred Owls during the night. Wednesday – This was our lazy days. Conrad and Jack took a hike while Steve fished, and Jim & Skip read. Conrad made pancakes and pre-cooked bacon for breakfast. We saw a black bear swim from our island across a span to opposite shore. Conrad had packed a small box of wine in the food barrel which sprung a leak during the Pig portage. The only food affected was the boxed spaghetti, but the accident necessitated a through cleaning of the food barrel. Spaghetti dinner was moved up in the order of meals and greatly enjoyed. Thursday – We were on the water at 9am and paddled back across three Narrows Lake past The Pig, hit seven small portages along Kirk Creek to come out onto Georgian Bay. We decided to skip site #137 and paddle another 45 minutes to camp on Crown Islands. Total paddle time from 9am to 3:30! Dinner was that San Francisco treat; Rice a Roni supplemented with additional rehydrated vegetables and hamburger. 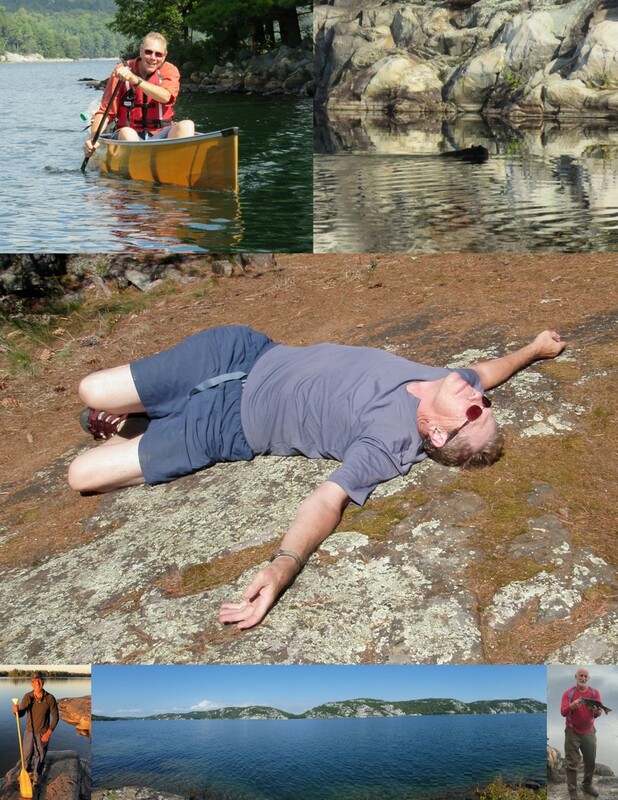 Friday – Rather than take the 800’ elevation gain portaging over the Baie Finn we opted for the Split Rock portage. We paddled continuously from 0830 – 0430. – 8 hours! Our campsite on Muriel was the best swimming site I’ve used. We were all tired. We did stop a couple of times (Jeff’s Point) to stretch, snack and drink. I went through a gallon of water during the day. Dinner was rice and Indian spices. Itsy Bitsy portage, everyone get out. To carry all this stuff you must be strong and stout. because itsy bitsy portage, it will never end. Whether it was the location, the food, the sensory overload several members of our group experienced hallucinations. In addition to Skip’s Bear Dream, Steven was convinced there was a kayak fisherman anchored across the bay who was fishing a prime location. In fact, Steve was certain he saw him pull in a fish. View from another vantage point the kayak fisherman turned out to be a rock cairn piled on a small ledge. Paddling out across Three Narrows Lake on Day 4 Conrad alerted the group to witness a mother loon and her chick sitting on a rock just ahead of us. Upon closer inspection, the “loons” turned out to be two proportionately sized rocks. ‘Cause in park Killarney hallucinations you’ll see. Skip is sure he saw a bear, but when we looked there’s nothing there. The company. 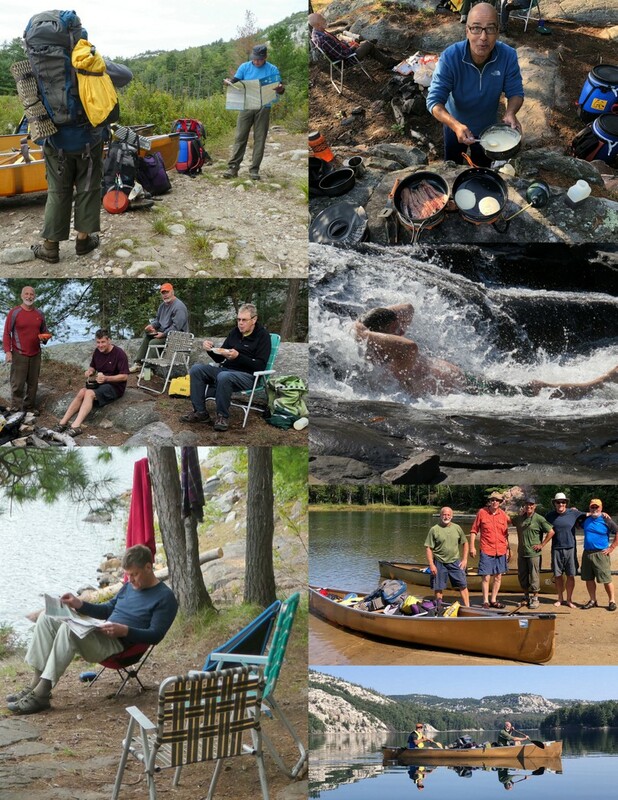 It was with trepidation that we joined an established group with the unknowns of group dynamics, leadership styles, food tastes, camp protocol, paddling speeds and sense of humor. Despite long days and occasionally arduous conditions we operated well. Awesome weather that allowed us to enjoy our surroundings. We covered some big, open water that could have been dangerous in windy conditions. Fantastic landscape with white granite cliffs at the shoreline. We did it and survived to tell about it. Although everyone suffered aches and pains along the way.